When you think about technology transfer from automotive, perhaps the first thing that comes to mind is that surely, it’s the other way around? Everyone knows how consumer technology is extremely pervasive and fast moving and that it is more likely to be at the heart of innovation. But, let’s consider the rest of the picture. Of course, automotive is traditionally seen as slow moving, restricted by stringent safety standards and the need to provide robust components that remain reliable over their long life time. While this may be true, today we are seeing that automotive technology is much more than that too. Recently at electronica, a panel of industry experts discussed this topic and shared some fascinating insights into the many complexities of technology transfer. The most striking point though, was the sense of opportunity and excitement for bringing parallel industries together to accelerate innovation. 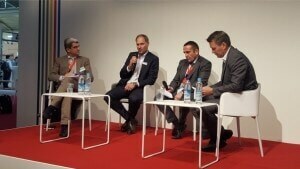 NXP’s Automotive CTO Lars Reger moderated the panel, which included Emmanuel Roger, technical director, Thales, Aurelius Wosylus, director sales and partners SigFox Germany and Davide Santo, product line general manager, ADAS, NXP. One of the main threads of the discussion was around cyber security and safety. This is not surprising given the amount of coverage on this last week at electronica. The past couple of years have shown that vehicle security can be breached and safety questions are rife after various recent incidents. Emmanuel Roger pointed out that the main difference between the two is the unpredictable nature of cyber attacks. So, autonomous systems need to have internal intelligence to monitor and update regularly – calling for a merge of big data and automotive capabilities to provide security mechanisms in network architectures. In parallel, the industry is driving towards zero fatalities from system failure with functional safety, which means that the largest outstanding concern is around human behavior. Since, the most significant contribution to reducing road fatalities in the future, will only happen once the human error factor is cut out of the equation. Who has the ultimate control? This leads into a debate over responsibility. Who has the ultimate control? As Emmanuel Roger explained, in an airplane, if there is a system failure, the pilot has to take back the control of the aircraft. The last action will always be the pilot. How does this translate to autonomous cars, or UAVs and will there be different requirements due to the higher security challenge? These are questions that are unanswered today, since the final responsibility is undefined. At some point, there will be a decision to define what level of failure rate is acceptable, although which authority will decide this is still unclear today. Regardless, the development of a safety model and the creation of safety standards can also benefit other industries, who can re-use the deep knowledge from automotive to different ends. The avionics industry operates in an extremely controlled environment, but this level of infrastructure management could act as a model for the future connected infrastructures on the ground and to manage the interaction between the UAV and ground infrastructures. In the same way, future avionic space may become more hybrid with one pilot in the plane and one on the ground. Meaning that a secure connection between the two is required. Connectivity would clearly be critical in this instance, but for other industries too, this is a touchy point. As Aurelius Wosylus explained, the value of connectivity is that there is no way to avoid it, what is unclear is whether the connectivity comes at the intrusion portal, or at the backend, or even at the software level. There can be no autonomous movement without being connected, but connectivity needs to be constant and safe, without loss of functionality. In a low-cost market, where washing machines, fire alarms and electricity meters are all connected and sharing data, the next question, is what do I want to communicate from a privacy viewpoint? While it’s true that connecting two devices together can create additional value, such as safety or predictive security, the question of privacy is going to determine connectivity uptake. Our lives are changing in that respect and our feelings towards privacy will likely change too. Changes are needed too in how the automotive industry functions. Davide Santo discussed how currently, new technology uptake in automotive is slow, but this is changing. This is creating space for new players, who further challenge the limits. Consider how artificial intelligence is changing everything in our lives: the automotive industry is centre stage for developing neural networks that can use fixed recognition algorithms to collect data. This is what we can see in cars using sensor fusion to locate objects. This learning can easily be pushed out to applications in other industries too and enable us to build machines that are superior to human capabilities and knowing which systems can be trusted. The panel highlighted the opportunity for cross pollination of technology today. Driving innovation in one area can really benefit multiple markets and accelerate development in the future. The merge of big data and automotive capabilities and understanding how to mitigate the risk of connectivity is key. You can read more about NXP’s visions for smart cities of the future here.